In order to improve decentralization of service, every user can run his own full node (often referred to non-block-producing witness node) and we here show how to do so. This will open port 8090 and make it available over the internet (unless you run behind a router/firewall). If you want to open only your (local) machine, replace 0.0.0.0 by localhost (e.g., –rpc-endpoint=”127.0.0.1:8090” ). Full node needs to synchronize the blockchain with the network first, which might take a few hours or days. 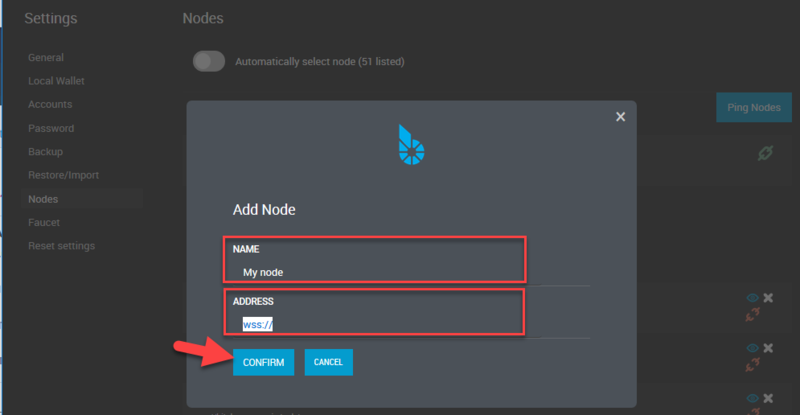 If **Automatically select node is ON, click to OFF the switch. There are four tabs. [AVAILABLE], [PERSONSL], [HIDDEN], and [TESTNET]. Congratulation, you are now connected to the network via your own full node.